Research has shown that the air indoors can be 2 to 5 times more polluted than outdoor air. Every breath we take contains millions of particles – bacteria, dust, spores and pollen, invisible to the human eye. The smallest particle we can see is about the size of a micron and there are 70 microns in the width of a human hair. About 99% of dust particles in the air in the home are smaller than a micron. But just because they are small does not mean they’re not dangerous. If someone in your home suffers from allergies or has asthma – and millions do – you know the obvious connection between dust, pollen, mould and sickness in your family. Now you can let your air conditioner keep your air clean, with 3M Filtrete. Turn your non-ducted air conditioner into a brilliantly efficient room air cleaner. The 3M Filtrete Micro Allergen Filter uses technologically advanced material with electrostatically charged fibres that work like tiny magnets to trap airborne particles. 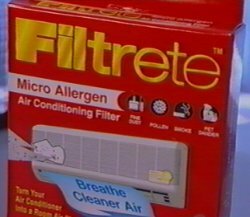 Filtrete works up to 30 times better than the ordinary foam filter in an Air Conditioning unit. 3M Filtrete suits just about any non-ducted air conditioner. You simply cut it to fit. The unique 3M Filtrete material has no unnecessary chemicals added and won’t support the growth of the mould or bacteria that can set off allergies and asthma. A Replacement Indicator lets you know when you need a new Filtrete and shows just how well the old one’s working. Make the air safer with the 3M Filtrete Micro Allergen Air Conditioning Filter. It’s unique and brand new to Australia so if your local retailer can’t tell you about 3M Filtrete you tell him.